Well, we spent this past weekend on the aforementioned tiling project. It was actually pretty fun. Fun due to the fact that I had a skilled teacher showing me what to do, and making all of the tile cuts, creating the pattern, and I just had to put them in place. So for me...it was fun! Until Day #4. Day #1 - Removed the wall trim. Installed new backerboard on the floors. This gives the tile a flat, thick, solid place to stay. Put down thin set mortar and then lay the tile in place using spacers for even grout lines. Day #4 - Day #25 - Clean the fu%^$ng tile that has thin set and grout all over it. Scrub until your hands fall off and then scrub some more inside the smallest room known to man. 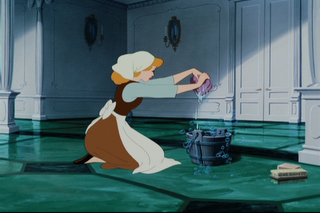 Sing songs with your husband about how much you hate scrubbing while scrubbing the floor while requiring that he calls you Cinderella. Jeremy: "Kara, I'm really sick of this, can we call it a night and work on it tomorrow?" Kara: "Uh, it's Cinderella. Not Kara. And no, we cannot go to bed, we need to scrub the floor to get all of this impossible cr%& off the tile. No sleep. More scrubbing." My sister called while we were scrubbing and Jeremy screamed out in the background, "SAVE ME". Did I mention the scrubbing part is the worst part of the tiling process? 1. Do you have a very skilled helper that will show you what to do and perform all mathematical calculations for you? 2. Do you own a tile saw, gigantic screw driver, and knee pads? 3. Are you really tidy, and clean up every piece of mud/dirt/thin set after use? 4. Do you have hands of steel that are accustomed to scrubbing something that is essentially the consistency of concrete, off of tile? If you answered yes, then tiling is for you. If not, considering hiring out. Okay, it wasn't that bad. It's really just the scrubbing that is awful. Jeremy says he's going to go shopping for some industrial strength cleaners today. Who knows what he will come back with. When we moved into our house he said he needed to go to Target to get something to clean our wood floors. He came home with 3 vacuums. Yes 3. A steamer vacuum, a mini vacuum, and a carpet cleaning vacuum. He can't be trusted at Target. Tomorrow...pictures of the tile! Woo-hoooo! I swear she did not make that up, he really did cry for help!! Yikes! Of the 3 tile jobs I've done, I wipe down each tile after setting it, then do a once over after all are set. Have never had to scrub beyond that before. Sorry it was a pain!